There is a moment when you stagger back into your home after five days in a field, and the concept of carpeted floors just looks… strange and alien. Maybe it’s tiredness, or the tendency of the human brain to adapt and then reject change, but the concept of solid floors becomes strange to your brain, and incredibly welcome. When you have a field, and it’s been raining for a while, and then you put a couple of thousand people on it, you get mud. Second event last year we had a similar problem, but that mud was being regenerated by fairly constant rain, this mud was drying out. 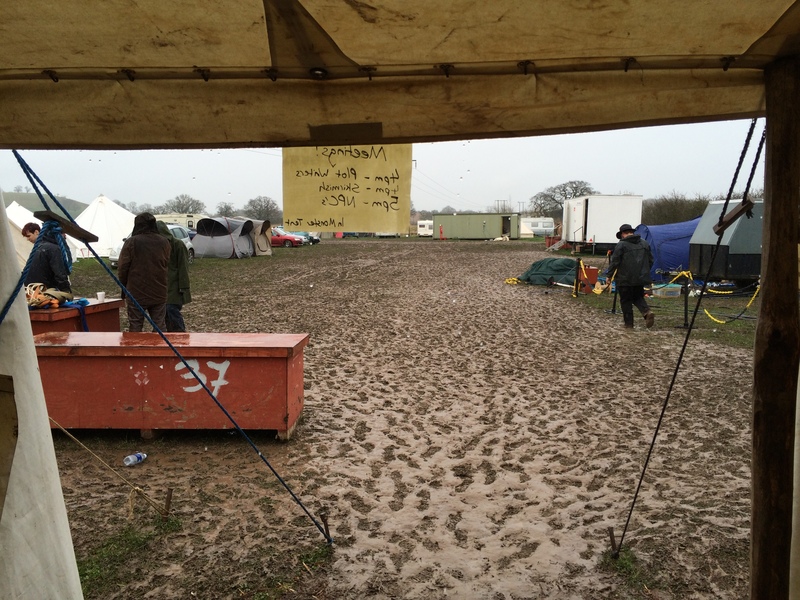 When we arrived, and the site was starting to look a bit bleak, people were saying “The drainage on the site is awesome” in an increasingly cult-like and familiar tone. It became something of a running joke, because on Sunday, when I took the header photo, it looked like that. But the mud was drying, though the thick, claggy, viscous semi-solid that sucked at your boots as it sucked at your soul, into – in some places – a walkable surface. An attack with a roller helped, but with some incredible effort on the part of our miracle-working site team, people were getting off the field. As a small part of PD crew, I am occasionally reminded that I work with some of the most dedicated and selfless people I have ever met, who sacrifice incredible amounts of both time and energy to make the game better for not only the players, but also the other crew. + Senate process is, I think, about as good as I can get it right now. + New characters with extreme interest in the senate processes make the amount of work I put into physrepping them more worthwhile. + The new procedure for not typing up senate motions during the event has made my life a lot easier, too. – … Except for Sunday, when I decided that the day was warm enough to forgo them, forgetting that the night would not be, and changing time is unlikely. – … I need to stop forgetting to reapply it in the mornings. + I actually had a lot of fun making this thing go, although it was the most exhausting event I’ve ever crewed (see above re: claggy mud). – The mud. All the mud. – A number of unnecessarily hard simple things, which we need to fix internal process on. – Same as above, but for my colleagues, and the rate at which it’s wearing them down. – Some timetable changes meaning my ability to social during the event has drastically cut down. – Guilt, since I can either get home in reasonable time *or* help pack down. This can only be fixed by learning to drive, really. In general, though, an exhausting but really good event for me. Thanks to the rest of the CS, especially Harry & Kate, for being a great team to work in. Lit. We did this once. I’m reasonably sure I know who those new players with interest in Senate procedures were and it was a joy to see them hit the game at high speed and with such keen. 🙂 That bits working mate :). Sounds like great fun. How often do you get to do this? This game – Empire – runs four a year, where I help with the internal Senate systems and do tech stuff. The other game by the same people, Odyssey, I’m slightly more involved (I’m a head referee) and that runs two a year. I play and crew other odd systems a few times a year, but there are loads around. Fantastic, thank you. I shall look into it.